What is a Health Stack? 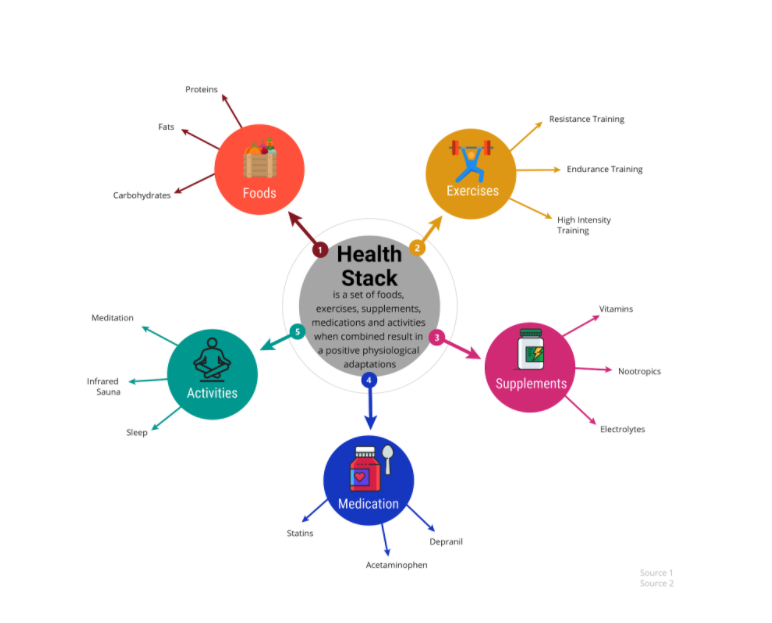 TrackMyStack extends the definition of stack to mean more than just supplements and also incorporates food, exercise, and activities into a stack. More on activities coming up shortly. A Health Stack is a set of foods, exercises, supplements, medications, and activities when combined result in a positive physiological adaptation. The different elements of a stack can fall into the category of anabolic or catabolic functions. For example, foods such as fruits have an anabolic effect on the body and apple cider vinegar has a catabolic effect. While considering a myriad of biological nuances, in essence, exercises can be divided into catabolic and anabolic actions. Resistance training primes the body to build (anabolic) and endurance training require the body to break down (catabolic) energy storages. Supplements can be distinguished similarly: creatine for anabolic and acetyl-l-carnitine for catabolic, as examples. With the understanding of how elements that are anabolic and/or catabolic add to an individual’s health, it is important to consider any activity which spurs a biological change to be part of the individual’s Health Stack. Activities such as meditation, sleep, infrared saunas have a biological impact. There have been increasing trends in health and biotechnology. 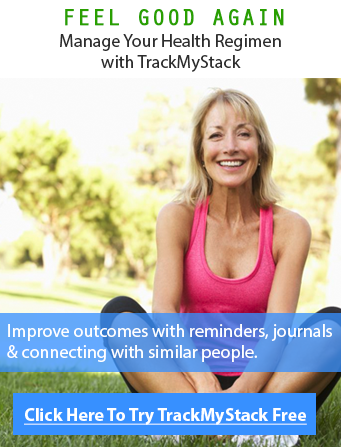 TrackMyStack gives users the tools to input various activities regarding health and the ability to track those activities. You are bound to make a mistake trying to remember the various components of your health regimen. Even if you hack your memory to remember all aspects of your health stack, you will not be to interconnect the different elements. Side note: I know a memory hacker reading the last line is going to say “challenge accepted” and I say “may the force be with you!”. For the rest of us, the Health Journal in TMS will serve as a snapshot of all your daily activities. Data from ‘Check-In’ posts in your Health Journal will help you plan, organize, interconnect and cross-examine your Health Stacks. 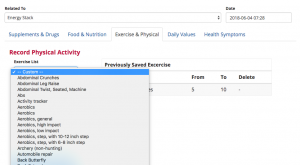 Hover mouse over ‘Health Journal’ on the main menu bar on top of the page. 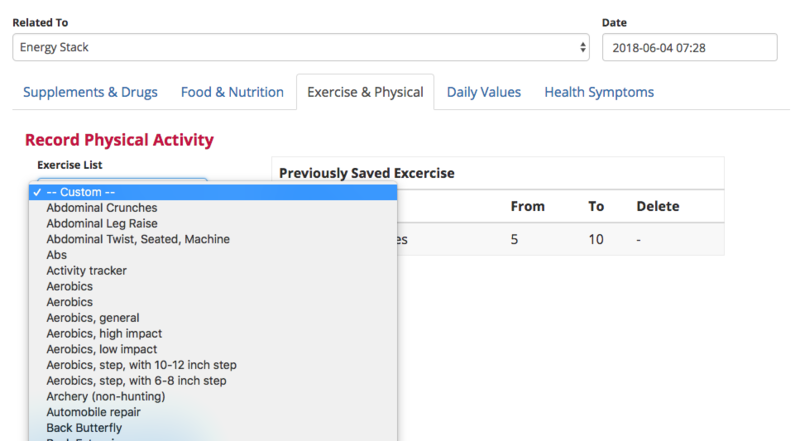 Pick a particular Health Stack from the dropdown under ‘Related To’. Toggle supplements to ‘No’ or ‘Yes’ (Tip: If you are checking ‘NO’ to fewer items, it might be helpful to ‘Toggle All’ to yes. Then, toggle ‘No’ to individual items that you did not take). Food & Nutrition as it Relates to Supplement in-take. Food and nutrition will serve as the foundation of your health. Dietary intake should be optimized to proved the macronutrient *requirement* of an individual. Tracking food intake will provide a judgment on what to supplement. For example, if you supplement creatine as a nootropic, it is recommended to be taken along with carbohydrates. If you use honey as the carbohydrate source and you have eaten rice or had other carbs, then you can skip out on honey. Tracking your food intake will allow you to calibrate your supplement regimen more precisely, if you realize that the food you ate one day mostly consisted of meats, you may want to supplement Vitamin K. Alternatively, if you feel like you are starting to get dry eyes and flaky skin, it could help if you take Vitamin A — one time or on an as-needed basis. This section is used to track anything that matters to you! It could be the number of stairs you climbed in a day, the number of people you spoke to, or essentially any metric you deem important for you to track. We provide pre-set values that we deem important as well. Evaluating your energy, focus, memory, mood, pain: These factors provide the core understanding of your subjective effects. Enter in exercise for the particular day to go along with your health stack. Tracking physical activity is beneficial because exercise makes an impact on our biology. Exercise is beneficial however it is important to keep in mind that physical activity will have an impact on other elements of your stack…. For example, one of the benefits of exercise is the hormetic ramp up in anti-inflammatory pathways. If your health stack has multiple elements and multiple items within each element then standardize your experience by creating a routine and stick to it until you have gotten desired effects. You can standardize your experience by optimizing the timing of each element. The timing of each element should allow them to complement each other’s effects. Next, select a duration of the experience, example: 30 days. During this period make appropriate ‘check-ins’ and record the daily values. Also, create custom value(s) to facilitate standardization. Objective measures will aid your experience in understanding your health stack. Objective measures are blood work, inflammation markers, cognitive assessment tests (ex: dual-n-back) and more. Daily values and objective measures will give you an understanding of how your health stack is stacking up in regards to your goals. You will become aware of the impact of your health stack. Singling out an item’s efficacy will challenging but possible. First, standardize your experience. Once, you are able to replicate the same result for a health stack then you can adjust a single item. Tinkering with a particular item will help you gauge how much of a bottleneck that item is to your goals. For example, increasing or decreasing your sleep volume and recording daily values throughout a given duration, ideally 10 days. First few days will be an adjustment period and then a week to decide if the increase/decrease in sleep volume is affecting your health goals. This could help you optimize the amount of sleep. Similar can be done for supplements. 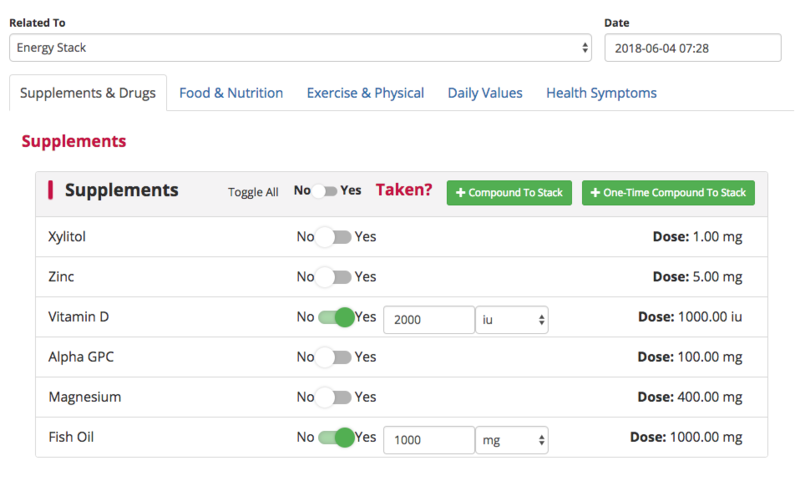 Make sure you can replicate desired effects from a supplement stack multiple times, then it will be easy to adjust the dosage of a particular supplement and record daily values. Also, in the situation of switching brands of a particular supplement, you can follow the above scenario to determine if the new brand has similar quality. Utilize objective measures to further aid your awareness in the changes in your health stack. Plan. Plan out your weekly supplements according to recommended time to be taken. Other elements of your stack will need to be planned out to fit your supplement timing. For instance, setting a bedtime to 4 hours after taking Vitamin B6. Once a good routine is figured out then the effects of each element should provide synergistic effects. Organize. When your supplements will be taken. Standardized everything, and track what you want to change. It is rather overwhelming to figure out exactly what to track. To overcome the daunting tasks, organize the elements of your health stack to track what you want to change. When you gain adequate flexibility in making changes to your health stack and become aware of the effects of the changes. You will have built a holistic understanding of your health stack. Interconnect. Most of us have many moving parts on any given day. This holistic approach should be continuously optimized, one might tinker with one specific element of a stack or get even more granular with an element and determine its outcome.